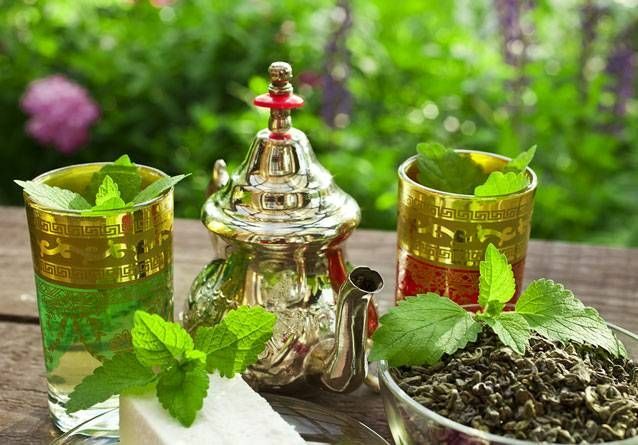 Moroccan mint tea widely acknowledged as Maghrebi mint tea, Sahrawi or Touareg, is an herbal concoction made from spearmint leaves and Chinese gunpowder tea. Owing to the various minerals and compounds present in it, this variety of green tea comes with a lot of health benefits. There is a difference of opinion amongst historians regarding the introduction of this tea in the Moroccan culture. Some say it was as early as the 12th century while others speculate it to be introduced in Morocco, not until the 18th century. Another story about its origination mentions that it was the brainchild of a businessman who could not sell his gunpowder tea in 1850 due to the Crimean war. Later on, he came to Morocco and found his fortune in spreading the mint tea through the entire Arab world. The Moroccan Mint Tea has an interesting tradition, as serving at least three glasses of this beverage by the head patriarch of the following is a common custom of hospitality followed in Greater Maghrebi, the refusal of which is considered impolite. The tea is known as “Touareg” because it is a good alternative to water, in particular for the nomads of Sahara. This tea has a moderate amount of caffeine. 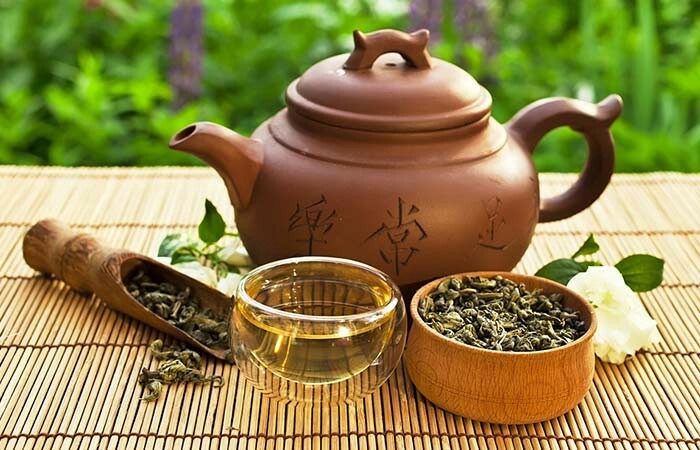 This tea with its spearmint content is good for easing flatulence, abdominal cramp, stomach bloating, irritable bowel syndrome (diarrhea, indigestion). Also, the mint oil of this spearmint is known to alleviate nausea with its fresh taste. Since spearmint has menthol which is laden with anti-inflammatory, anti-spasmodic and analgesic properties this tea relieves the problems of a cough and sore throat by reducing the irritation and congestion in the respiratory tract. While the gunpowder tea is enriched with anti-oxidants like epigallocatechin gallate and polyphenols, spearmint also displays antioxidant properties which together shields the body from cancer by inhibiting the free radical producing enzyme and neutralizing them. 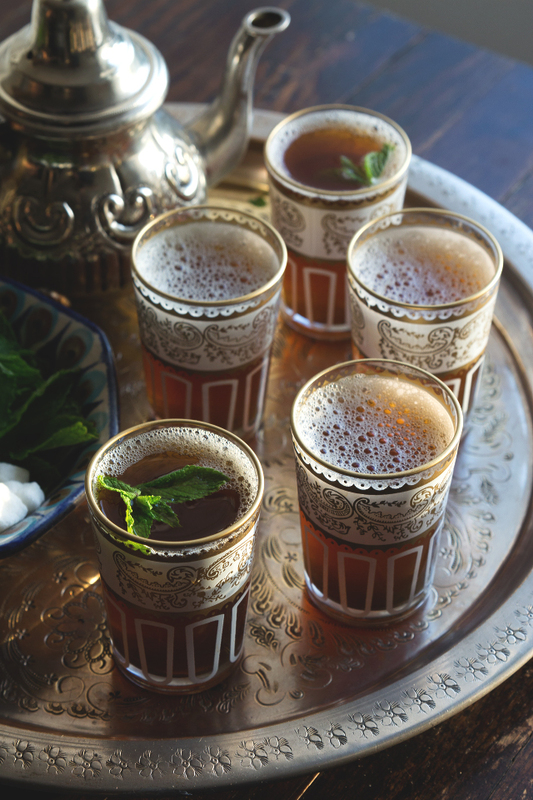 Moroccan mint tea contains essential minerals like fluoride, calcium, magnesium, copper, and selenium, which back up the immune system. These also help to keep all kinds of fungal and bacterial infection at bay. 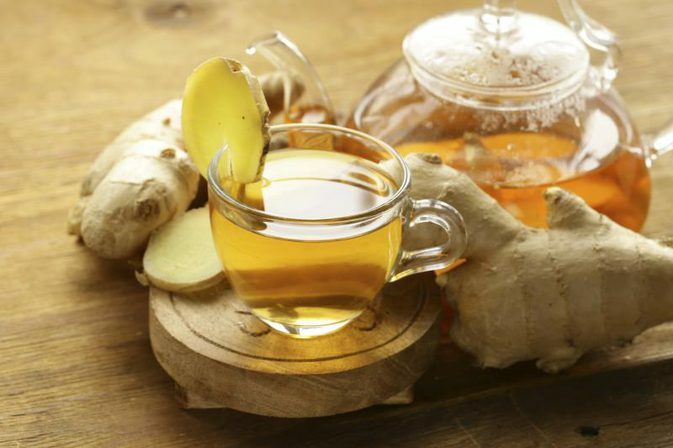 So, a cup of this tea might help you maintain your overall health. 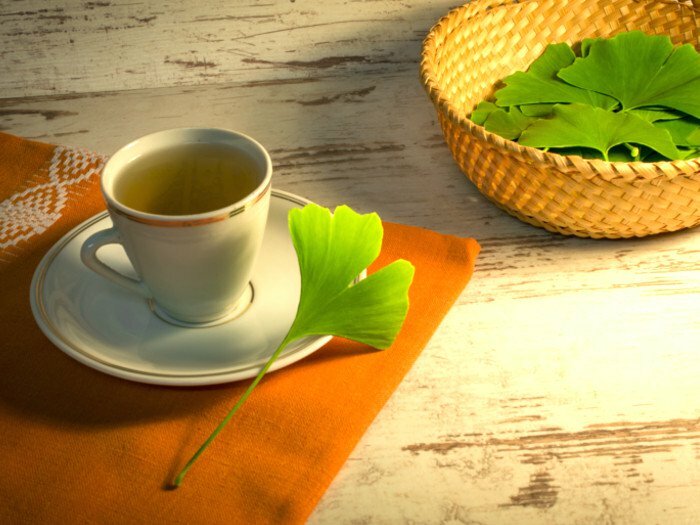 Vitamin B complex is abundant in this tea, making it a preventive measure for cardiovascular problems. Niacin (vitamin B3) decreases the bad cholesterol or “LDL,” and increases the good cholesterol or “HDL.” Moreover, the folic acid of spearmint helps reduce the chance of artery clogging by controlling the amino acid homocysteine. While spearmint has thiamine that lessens the blood sugar level, gunpowder tea has a positive impact on glucose tolerance, improving the insulin sensibility. This tea, with its mint content, is known to have soporific properties, soothing your nerves and helping you get rid of anxiety. 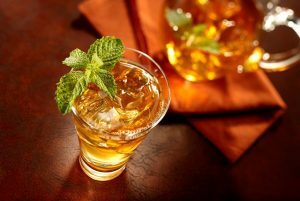 The mint tea with its germicidal properties secures your oral health by restraining the bacterial growth inside the mouth. It also fights bad breath with its strong aromatic flavor. The spearmint content of this tea helps you maintain acne free skin, by reducing the sebum oxidation, a major prerequisite for acne formation. 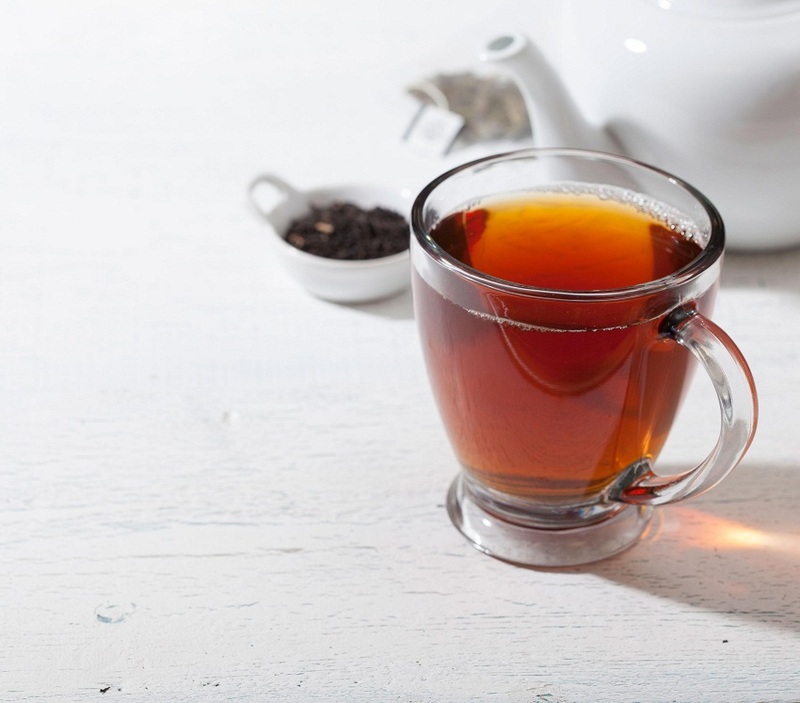 The gunpowder tea is full of catechins, thiane(anti-obesogenic), which boost up the metabolism and slow down the growth of enzymes which cause fat storage. Similarly, the mint also helps in transforming the fat into energy. 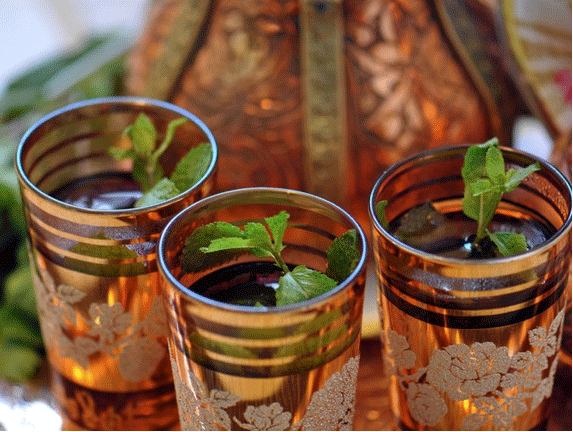 For, Moroccan mint iced tea, refrigerate the tea and serve with some ice cubes. 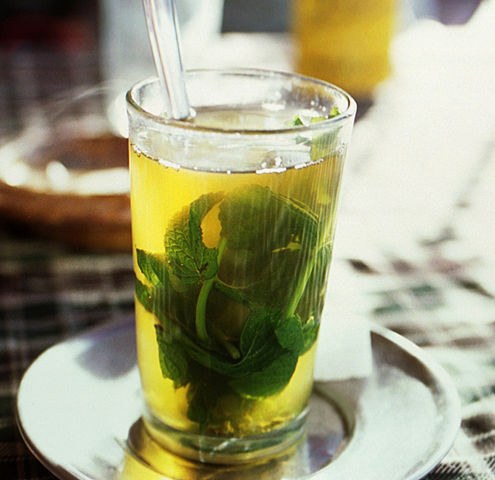 To make Moroccan mint tea granite, mix and boil all ingredients together along with orange blossom water. After ten minutes of steeping, strain and incorporate food color. Refrigerate until it gets the granite texture. Over consumption might result in nausea and dizziness. Since, this tea contains caffeine, a prior consultation with your doctor is recommended. 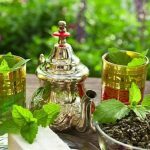 You will get organic Moroccan mint tea bags and rolled tea leaves (sometimes with peppermint flavor) in online and local stores.